GOP strategist Mike Murphy appeared on Meet The Press today to discuss the current state of Donald Trump's presidency and the issue of trust. The self-described "infuriated," "TV blabbermouth" slammed President Trump for fomenting "chaos." Much of the chaos and mistrust Murphy attributes to President Trump can be traced back to overreactions and blatantly fake news by the mainstream media. Does President Trump help himself with his tweeting and mixed messages from his surrogates? Not always, sometimes his tweets seem rather silly. Sometimes they are beneficial and help rally his base and supporters. As for mixed messages from his surrogates, Sarah Huckabee Sanders - under the direction of Hope Hicks - handles the press with quick wit, grace, and articulate answers. But the vast majority of the supposed "trust" problem does not stem from the bogus claim that Donald Trump's presidency is built on lies and deceit. It is created by the mainstream media's and moderate republicans' refusal to give the man credit where it should be given. This should not be surprising coming from Murphy, he has been critical of President Donald J. Trump since he was primary candidate Donald J. Trump. From Real Clear Politics' Tim Hains in April 2016, Murphy early on made mention of Republican professionals who believed Trump was at a disadvantage. "Republican strategist Mike Murphy, who headed a pro-Jeb super PAC that wasted tens of millions of dollars attacking Donald Trump and Marco Rubio in Florida: "The lights are going out across the Republican Party tonight… It’s like Trump has built a lab to blow a general election, even against Hillary Clinton." MIKE MURPHY: I don't know any professionals in the Republican party that don't think he's at a disadvantage. To slaughter the words of Sir Edward Gray, the lights are going out across the Republican Party tonight, and we may not see them turn on until after the next presidential election. It's like Trump is building a lab to blow a presidential election. Maybe I'll be wrong. I'm still not positive he'll be nominated. But things are going his way in the primary now. The thing will be the pivot to the general election. I think Trump's method will be to turn on the insult comedy against Hillary Clinton in the primary. Of course, Trump went on to win the GOP primary and ultimately the presidency. 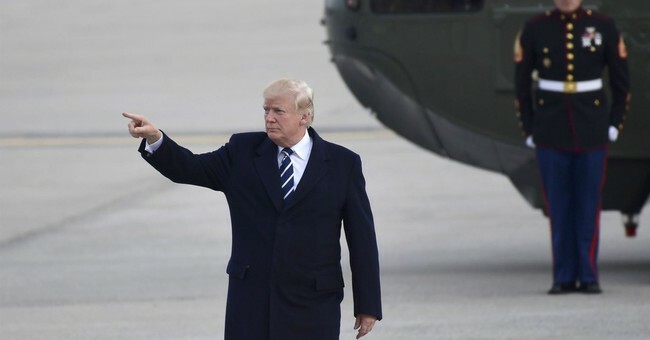 And so far during his presidency, President Trump has had resounding success in many areas such as the economy, the battle against ISIS, cutting back regulations, and the judiciary. For the economy, as Guy pointed out, the unemployment rate is doing well and will likely be bolstered even more if the GOP tax bill gets signed by the President, which most likely will happen after the Senate's passage on Friday night. "The US economy added 261,000 jobs in October, rebounding from a hurricane-drenched September. Other indicators were mixed, although the primary 'U3' unemployment rate has tumbled to 4.1 percent -- the lowest level in 17 years, as various Trump administration officials are eagerly pointing out today. Despite some lingering concerns about the strength of employment and economic growth, the overall picture continues to improve," Guy wrote. At the the time, Guy also added the "economy isn't exactly roaring, but it's in a pretty good place -- hence the low unemployment rate and robust consumer confidence, each of which are at their strongest levels in nearly two decades. Republicans will argue that tax reform will help hypercharge lagging economic elements, and that middle class Americans facing relatively stagnant wages would benefit from an average tax cut of nearly $1,200." Indeed, in his assessment just three days ago, the economy for all Americans will greatly improve, despite the left's warning. "The data proves that the overwhelming majority of all taxpayers (including, if not especially, the middle class) would get a tax cut under the bill, which would also significantly improve the US business climate for corporations and small businesses, resulting in faster economic growth and nearly one million new full-time American jobs. What it would not do -- contrary to some of the scurrilous rumors and baseless claims flying around -- is create special new "tax breaks" for private jet owners, eliminate the popular mortgage interest deduction, or "kick millions off of healthcare" (a distortion that doubles as a bogus claim that poor people would get slapped with "tax increases" under the legislation)," Guy wrote. As for ISIS, Sec. of Defense James Mattis said just yesterday we are defeating them much more quickly than expected. In just 10 months in office, the US military has already taken back Raqqah from ISIS, the caliphate's self appointed capital. "The defeat of ISIS in Raqqah represents a critical breakthrough in our worldwide campaign to defeat ISIS and its wicked ideology. With the liberation of ISIS’s capital and the vast majority of its territory, the end of the ISIS caliphate is in sight," President Trump said in October. As for another area of the economy, President Trump's deregulation has already saved businesses $378 million with over a billion in savings expected next year, according to the Washington Examiner. "Simply cutting red tape and putting Obama-era regulations on hold have already saved $378 million since President Trump took office, and that savings is expected to jump into the billions next year when the administration’s anti-regulation campaign hits full stride, said a new report. As if things are not bad enough for liberals who want the 45th commander-in-chief to fail, President Trump's legacy will last far beyond his administration. The man's reshaping of the judiciary has guaranteed conservative judges and precedents for the better part of the next 50 years. "President Donald J. Trump has done more to reshape the federal judiciary with a conservative outlook towards the constitution than any president since Richard Nixon. And again, President Trump is only fulfilling his agenda he promised during his campaign. As for illegal immigration, President Trump still has a lot of work to do. The wall still needs to begin construction and it is unclear what exactly the plan is for DACA recipients. But again, it is not as if moderate Republicans are helping him in that area. According to Murphy, they simply "fear how they will get back back the agenda." But, if the FBI's Russian investigation into the Mueller probe is the main cause of distrust for American individuals, members of the media may want to take their job a little more seriously and actually report the facts of the case. As noted yesterday, the Stock Market trusts the mainstream media so much that they were willing to sell stocks in fear of a crash based on their reporting. ABC's Brian Ross issued a false statement about candidate Trump instructing General Michael Flynn to contact Russians. Of course, it was President-elect Trump. But, this error which Ross has since been suspended four weeks without pay for, led to a dive in the stock market of nearly 400 points Friday. If the mainstream media truly is concerned about trust in the age of President Trump's presidency, it would be nice if they started reporting on his success more and getting actual GOP strategists on air who want to unite the party behind the President's agenda.